Is checking concentricity of the projectile more important than having say .002 or .004 of neck tention? what works best and why? (suppose it sould be a step in load development)and how do you advise checking neck tention? When deburring the flash hole inside the brass: I have found that some of my flash holes end up a little larger than others. I am using a Sinclair power center. havent noticed many others watching this thread but i would say ere on the side of consistancy. I know trimming is a pain and usually not needed but isn't there a potential problem if the case grows and jams into the chamber and possibly creating an overpressure or something? or are barrels bored out lawyer proof and with excess space built in? Wow. Thanks. That was very useful. Very good post and write up on reloading. I like to use the redding comp shell holders that are in graduations of .002 for bumping shoulder. Makes it easy and keeps shellholder square on die body base. And on the trimming. If the end of your neck runs to far into chamber end it will crimp into bullet. This will make for uneven bullet tension around the neck and make for bad bullet runout as it leaves the case. <div class="ubbcode-block"><div class="ubbcode-header">Originally Posted By: lostcoyote</div><div class="ubbcode-body"><div class="ubbcode-block"><div class="ubbcode-header">Originally Posted By: in2deep</div><div class="ubbcode-body">I know trimming is a pain and usually not needed but isn't there a potential problem if the case grows and jams into the chamber and possibly creating an overpressure or something? If the case gets to long, it will engage the rifling at the same time the bullet tries to giving us a wild & very dangerous pressure spike. If we hack it back to bare minimum we may have given room for a little loss of accuracy, especially with rough handling of ammo in the field. But we HAVE TO maintain consistency from case to case for shot to shot. The answer is to measure the chamber length in your individual rifle and stay trimmed back from that actual number. Small chamber plugs to get that measurement are sold by Sinclair and others. 1. thoroughly clean your weapons chamber. 2. take a scrap case and trim it WAY back with your case trimmer, say .050" SHORTER than book spec. 3. Seat you plug gage into the case- long. 4.ease this round into your weapon and fully close & lock the bolt. 5. remove the case gently without bumping the gage. It has hit the end of the chamber and been pushed back into the case by the action of locking the bolt. Measure the overall length of the case, head of the case to end of the plug and note that measurement somewhere obvious & permanent in regards to loading for this particular rifle. It would probably be a good idea to repeat this measurement three times and average all three readings. Now until this dimension were to change (barrel removal, etc.) trim your brass just short of this measurment, instead off BOOK trim to length specs. Tres does not say (in the last sentence quoted above) how much "just short of this measurement" actually is. Do we trim .001 shorter than measured chamber length? What is the actual number to define "just short" in this case for trimming just short of measured chamber length? </div></div>This comes under the heading of coolest tools that you can't buy. Combined with a Hornady LNL tool, easy as pie to get the neck length of your chamber. I'd make one but my lathe is in storage where it's been for 3 years, an 11x24 that can't be setup at a moments notice. Perhaps I should get Sherline, which I've had in the past. Any chance you'd make em for a price? Good write up, but does this method work with a gas gun? FWIW, I have never had to trim after intial case prep on virgin brass. You will have extraction problems due to the shoulder of the cartridge being too long (resulting in "sticky bolt") way before the case neck reaches the end of the factory cut (lawyer proof) chamber/throat. I reload a lot of .308 WIN, .270 WIN, and .257 WBY, and neck size only with redding type S. Even on my $1.50/ea WBY brass I've reach 8-10 reloads before primer pockets become loose and I scrap the cases to be used for set up only. I only have to bump the shoulder once or twice before then. IMO, trim short, trim once. Broken Sailor, a lot of debate about how to keep extreme spread and standard deviation down center around primer selection and primer pocket prep. I have a friend who chamfers/deburrs both sides of the primer pocket. He thinks it helps channel the spark into the case better resulting in lower ES. As long as things dont crazy, a thou or so larger hole shouldnt produce problems but mean your cases arent consistant. Is the case wobbling in your fingers causing an inconsitant hole to be cut from case to case? Thanks for the ideas. It's fun to learn new reloading techniques. Never wanted to get into annealing and neck turning but noticed after 3X firings on my nosler .260 brass that the bullet seating pressure had changed dramatically. Used to slide in nice and easy; could tell the brass did not have any spring left because of work hardening. Annealed brass and all is well. First, let's assume we have our shoulders bumped to .003 under our chambers headspace measurement. Now, after determining your total chamber length, how many thousandths under do your trim your case length to? I would think you would want your cases as long as possible for the neck to support the bullet without it exceeding your chamber length so .003 under? .004 under? I understand consistency is the goal here and as long as possible the better, but I suppose it all depends on if your cases even approach that chamber length. Let's say your chamber length measures to 3.000 just as a round number. Out of 50 cases, your longest is 2.998 & your shortest is 2.993. I would assume you just cut them all to 2.993 for consistency but unfortunately, you're losing .005 of neck support. If you could cull out your 10 shortest, maybe then your shortest now is 2.996. Now you could cut the 40 to 2.996 thus gaining .003 more neck support. Also, since the case expands upon firing, I would assume it expands lengthwise also to a certain degree but is also limited by restricting the shoulder from expanding only that .003 forward. Let's say you were somehow able to get 40 cases to 2.996. When that round fires, I'm thinking it will it expand lengthwise .003 until the shoulder makes contact within the chamber. This should keep the end of your case from going past your chamber length measurement with it coming up .001 short. I couldn't imagine the neck alone lengthening much if any at all if the shoulder couldn't get past the headspace. I will personally keep the length of my .338 LM cases to exactly .004 under my chamber length. But, I will always ensure my headspace never exceeds that .003 thus preventing excess expansion and the end of the case going beyond my chamber measurement. I hope I described this in a way that makes sense. I had to pretty much talk my way through it for it to make sense to me. <span style="font-style: italic"><span style="font-weight: bold">Now here's something that'll challenge y</span>ou;</span> I own 4 Weatherby Mag guns (.240, .257, .300, & 30-378) and in those cartridges the headspace is determined to be at the top of the "belt" near the base of the cartridge & NOT the shoulder if I understand correctly. Thus it's referred to as a "belted magnum". Here's where it gets tricky; Because in our standard non-belted rounds the shoulder is what stops the lengthwise expansion of the case forward, in the Weatherby Mag brass, there is more chance for forward expansion of those cases because you have the entire case body expanding forward. But wait, can we still restrict that forward expansion by knowing the distance to where the shoulder would rest in the chamber or not? Weatherby has the "double radius" shoulders and are they even meant to rest against a shoulder "rest" within the chamber since the top of the belt is actually the "headspace"??? Now, when "fireforming" a case, will the fact that the top of the belt being way down by the base of the cartridge and it being the "headspace", prevent the shoulder from ever reaching the area in the chamber where the shoulder would rest against? If the shoulder never reaches this area, why would you even have a reason to bump the shoulder back .003? But, in the picture examples for this thread, it looks like he's using a .300 Win Mag case which is also a "belted magnum" case. "On a rimless cartridge such as the .308, the stopping surface is the shoulder. On a rimmed cartridge like the .30-30 or .303 British, the headspace is the gap for the rim. On a belted magnum, headspace is the gap for the belt." "And the rimmed and belted magnum rifles? Dealing with the rim or belt and the shoulder at the same time is a reloading problem, involving expanding the neck and resizing it down to create a false shoulder, then fire-forming the brass to your chamber. On a .303, I wouldn’t waste time. When I tried it, I got one extra loading out of my brass. On a .300 magnum, it is definitely worth the extra effort." So, it states it's a "reloading problem". Great. When he talked of fireforming being worth it for the .300, I take that as you can form the case to make contact with the shoulder then? If anyone knows how to specifically deal with the belted magnums, please let me know how to incorporate the detailed brass prep that works so well with the unbelted cartridges. Thanks. Sorry if this was too confusing but I tried to explain it as plainly as possible. So I have an ultrasonic, tumbler and stainless media cleaners...I find the the stainless media in the Thumbler gets the brass the cleanest but the ultrasonic does a pretty good job as well.... are there any advantages of one over the other for precision... I am shooting under 1 MOA with my gas gun for 3Gun so it has not been an issue for me yet....but now that I am moving to long range precision I would like any input available. My .45 Colt fire formed brass measures .005" shorter than when I loaded it new. I am using a lever action rifle. Is this normal? Would or could I see the same in a different caliber, such as a .308? For utmost accuracy I would also suggest neck turning. So after reading your thread and searching around here is the reloading procedure that I came up with. Any comments on the steps, or the order they are in would be greatly appreciated. 1. Inspect brass and flash holes. Also, are we to assume that all your fired cartridges necks grow the exact same lenths per shot, and that is why we don't have to trim them everytime? How will that change the POI from the first firings when the cases necks were shorter and the bullets were seated slightly differently? Great thread, I keep coming back to it. I'm new to reloading and have a lot to learn, but this water method seems a bit flawed. Water is going to be stuck in the case when poured out, maybe not by much, maybe a drop or less, is that amount something to be accounted for? Unless there is a way to pour every single drop of water out of the case that I do not know about, then please let me know! I just bought a 338 Lapua Magnum, I have so many questions and so confused bc there is so much information out there. Even though I don't understand most of the things you guys do, thank you for the info here, I have a lot of reading to do. 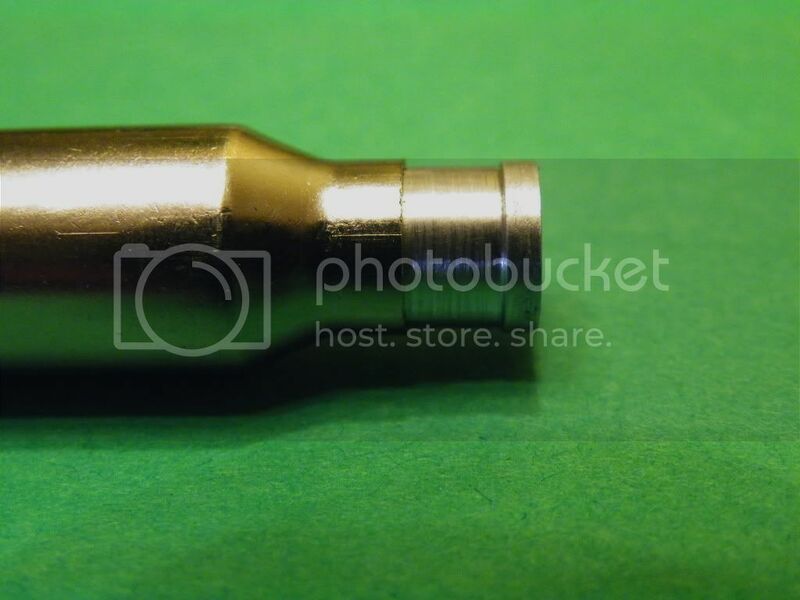 mk75, some people even weight sort there primers..
As for neck turning, I have been using Nosler cases and found them to be really uniform so I have not been turning with good results..
Quick question regarding case prep... specifically sizing for correct headspace. 1.) you fire form the cases in your rifle. 2.) measure the cases (base to datum line) to determine the headspace of your rifle's chamber. 3.) bump the shoulder back .003 of an inch from the measurement of the fire-formed case. I fired 100 rounds of brand new brass in my rifle. I measured about 45% of the cases and got a range of measurements (thought it was user error, but confirmed repeatedly and the numbers are solid). Two cases measured out to 2.620 (longest), seventeen cases measured out to 2.618, nineteen measured out to 2.617 (the most), and a smattering in between. When I am determining the head to datum line length, logic tells me that I should be working off the longest case that was fired from my rifle... hence, I would be size my cases .003 less than the LONGEST case that I measured, even though only two of the 45 measured were that long (2.620 necked down to 2.617). Is this correct? <div class="ubbcode-block"><div class="ubbcode-header">Originally Posted By: punter</div><div class="ubbcode-body">Quick question regarding case prep... specifically sizing for correct headspace. Not in gas guns (14 types and Garands). <div class="ubbcode-block"><div class="ubbcode-header">Originally Posted By: Old-is-Good</div><div class="ubbcode-body">Great write up on sizing brass but I have a question. I've been resizing once fired Lapua .308 Win. brass. I used the Sinclair comparator to measure the fired headspace length and most of the cases are within .001" of one another. However, there are some cases that are .002-.003" longer than the rest. Since all these cases were fired in the same rifle, shouldn't they all be the same or almost the same ? Now the second part of the question. I set my full length re-sizing die to bump the shoulder back .002" on the shortest measured case. For most of the cases, no problems. But what about the cases that were longer ? Even after sizing, they're still .002-.003 longer than the normal 'after sizing' measured headspace length. Forgive me if I missed the answer to this question but I did not see it addressed anywhere. I just started bumping the shoulder using a Redding body die and I have the same question. Details! details! detail! Great write up! I don't know how I have missed this post before. So are you saying you prefer/that it is better to "bump" the neck back .003" instead of using a neck sizer die? "The answer is to measure the chamber length in your individual rifle and stay trimmed back from that actual number. " TresMon, how far back do you recommend trimming? .003, .005, .010? When you do trim, always smart to go .010, to lengthen the time till you have to trim again. I would trim when I got to say.003 from chamber end, and then take it back at least .010, probably .013 so I was a full .010 away from what I would consider the danger zone. If you don't trim soon enough, you can cause the case to start into the throat and possibly "crimp" onto the bullet, so to speak, and cause pressure issues. I'd be happy for input from others on this too. When you do trim, always smart to go .010, to lengthen the time till you have to trim again. For brass that I've tumbled with stainless media, I find that the edge that the Giraud trimmer puts on the case mouth gets beaten down and dulled a bit - this has the effect of both trimming the length somewhat and of course reducing the amount of chamfer inside the neck. Maybe it's OCD, but for this reason I like to trim as little as possible so that I am basically just touching up this chamfer (the length is not really being reduced much at this point). TresMon, Thanks so much for taking the time to make this series. After reading it I bought a press, some dies, some components, and a few accessories and decided to give reloading a shot. I used to get crap precision out of my Remington 700 using the cheapest ammo I could find, but my first time out with the handloads I made using a good bit of the advice in your posts, I shot about half MOA at 700 yards with the starting load for .308 winchester and shot a ladder test which indicated two nodes I intend to explore further this weekend. I was shocked, and a little intimidated by my own achievement. it seems to take a little longer to do it this way...but it makes perfect sense. I think I will start take care of my brass. thanks for the great write up. I just received my sinclair chamber length gauge. Here is the warning that came with the instructions of the chamber length gauge. "Excessive case length will cause dangerous chamber pressures resulting in personal injury. We do not recommend increasing case length beyond published SAAMI specifications. DO SO AT YOUR OWN RISK! If you do increase your case length, maintain the case length so that it is a minimum of .024" shorter than the chamber length. If I am understanding all of this correctly, you should stay .024" shorter than your chamber length. The chamber length on my rifle measured at 2.039"
So my max case length would be 2.015. Same measurement that the Hornady reloading manual gives for max case length. So I should trim below this length to keep the case at a safe length. My rifle just happens to have a chamber length, the exact dimensions of the SAAMI minimum chamber specifications for 308 winchester. So the manual is correct for me and my rifle. I think that I should trim to 2.010 and not trim again until my cases reach 2.015, this will give me a small accuracy increase and keep my rifle functioning safely. I am reloading for a semi-auto so it is extremely important to not have any pressure problems because of headspace or case length issues. TresMon, This is a great write up and has really helped me a lot, thank you. Could you please give me your input on this. This is great info, tagging in. Great thread lots of good info. I'll be putting it to use soon. All brass have been fired in the same chamber about 6 times, never fired in another gun. The article talks about bumping the shoulder .003 looking for advice on how to proceed. I use an RCBS FL die. To the op, I am totally new to reloading and I'm a young shooter. I have not yet started reloading at all just getting all the stuff. But today I started to try to resize my brass using the soot method talked about here. I could not get any of the marks specified but it took all the soot off of the mouth about .1"down the case mouth cleaning all the soot off and it took the soot off of the case on the body after the shoulder. Does this mean I don't have the die screwed down enough and the decapper and expander ball needs to be backed out more? Also regarding the bumping the shoulder back, is this just done by adjusting the die back so it only touches the shoulder? Or do you full length size it, I got kind of confused reading through everyone's comments. If you can clear up how bumping back the shoulder is to be done for me that would be greatly appreciated. Thank you for the multiple awesome write ups. For those wanting to measure the H20 Capacity, there is no need to dump the water out and weigh it. Just take a fired case, clean it, weigh it and zero the scale. Now add water and weigh again. If you dump and weigh it you are loosing the volume of the water still stuck in the case. The tricky part of getting a consistent volume is making sure the water level is the same on all measurements. You can pour water in and see it sitting higher than the case mouth due to the water surface tension. This "bubble" can actually be different sizes making it easy to get multiple weights from the same case. I just fill it until it is completely flat with the case mouth. If it's slightly higher, just use the corner of a paper towel and barely touch the bubble to wick it away. Make sure the case is dry before weighing it. Another method of determining the max neck length is to make a chamber casting using Cerrosafe. This stuff melts below 200 degrees making it easy to use. Cerrosafe shrinks during the first 30 minutes of cooling and then at the end of an hour, is EXACTLY chamber size. You can also re-use it on multiple chambers.